for all types of sporting injuries and general muscle strains and pains. Why use TheraFlex for Pain Control? Pain and muscle spasms are a common responses to injury. Tendons and ligaments are tissues that connect muscles and bones to each other. These are made from protein called collagen, normally collagen is flexible and acts like a "rubber band": and stretches when tension is applied and returns to its normal length when the tension is released. However, when the tendons and ligaments are stressed too far, it tears. In this tearing process, blood vessels are torn and blood cells and fluid escape into the spaces among the muscle fibres. This is sometimes but not always visible on the surface of the skin as a swollen, bruised area. When Cold Therapy is applied to the area it decreases the flow of this fluid into the tissues and slows the release of chemicals that cause pain and inflammation. Cold also decreases feeling in an area by reducing the sensitivity of the nerve endings. Cold therapy also decreases the activity of cells to reduce swelling and internal bleeding at the site of acute injury. Cooling the deep tissue also reduces muscle spasm by reducing the muscle's ability to maintain a contraction. 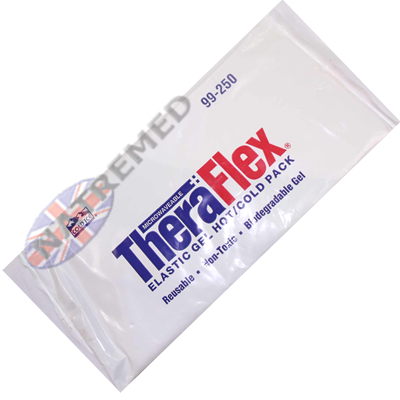 TheraFlex maintains an even temperature over the entire pack and stays flexible even when frozen. When the pack is bent to fit it maintains it's thickness no matter how severe the bend. TheraFlex Gel is completely safe, it contains no liquids or dyes, is non-toxic, colourless, and odourless, but has a bittering agent to deter ingestion. 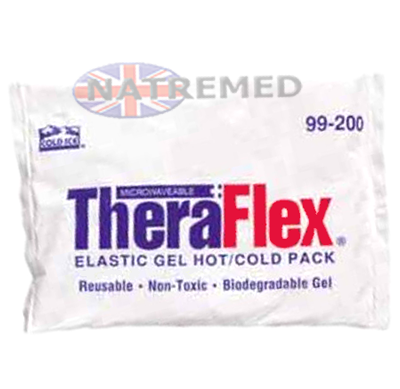 TheraFlex Gel is also biodegradable and the packs are re-reusable. This new gel chemistry is manufactured using 100% pharmaceutical grade materials. Unlike other thin, watery gels that will leak and saddlebag TheraFlex retain their thickness no matter how severe the bend is, it is formulated as a thick, rubber-like gel making it ideal for compression wraps that will not leak or spill even if the outer wrapper is punctured or torn. 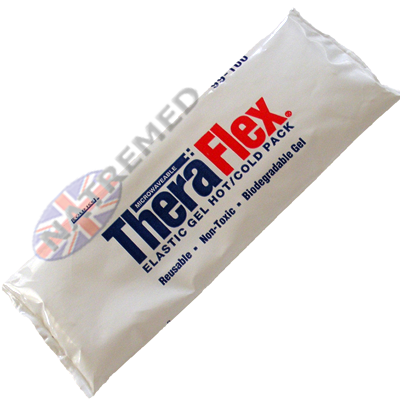 TheraFlex can be soft frozen in any domestic refrigerator / freezer. This unique gel formula will retain cold longer than most other cold packs currently on the market. The Cold Pack's Gel is formulated as a thick, rubber-like gel making it ideal for compression wraps that will not leak or spill even if the outer wrapper is punctured or torn. 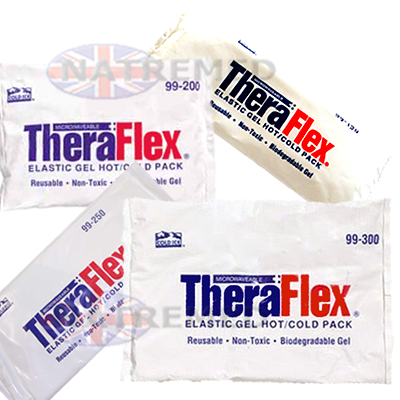 TheraFlex Gel is biodegradable and the packs are re-reusable. This new gel chemistry is manufactured using 100% pharmaceutical grade materials. 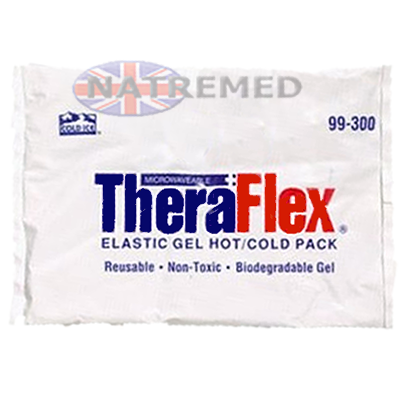 TheraFlex Gel is completely safe, it contains no liquids or dyes, is non-toxic, colourless, and odourless, but has a bittering agent to deter ingestion. Unlike other thin, watery gels that will leak and saddlebag.